Oh my goodness, I'm just loving the new Elegant Tags and Sentiments release. Buttons and Blooms Collection and you're going to LOVE IT!!! Instructions: Card size is 6 1/4 x 4 1/4”. Score 8 1/2 x 6 1/4” white cardstock on the long side at 4 1/4” and fold to create card base. glitter and adhere to the decorative tag. Adhere Swarovski crystals as shown. 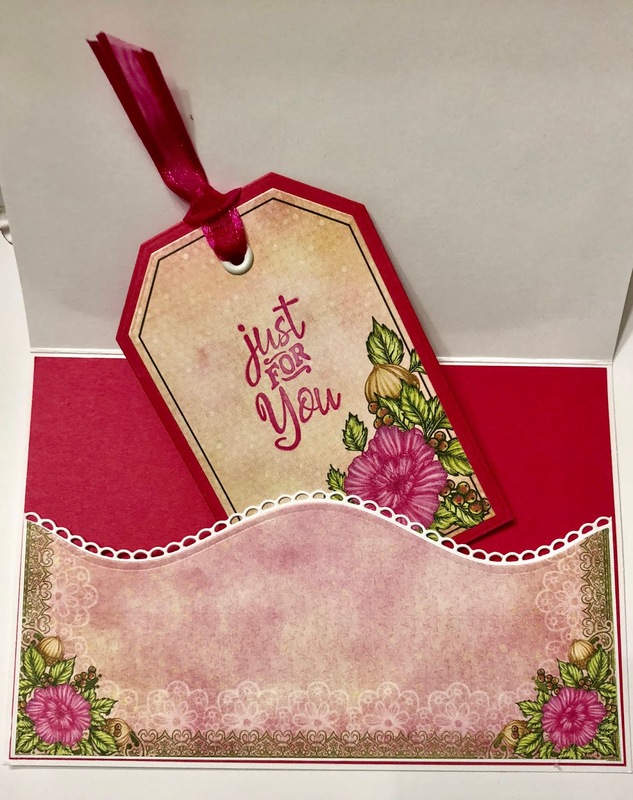 Stamp the Oakberry Lane Blossoms on Floral Cardstock using Archival Cactus Flower ink and color with Archival Magenta Hue ink. Stamp the Leafy Accents on white floral cardstock using Archival Olive Ink, color using Archival Leaf Green and Olive inks and diecut the blossoms and leaves using the coordinating dies. Place the flowers and leaves in the 3D Blossom Mold face down, spritz with water and run through the die cutting machine to shape. Finish off the blossoms by using the stylus from the deluxe flower shaping kit to press down in the middle. Adhere the flower petals together using dries clear adhesive. Use two petals the same size for the small blossoms and three petals for the medium and larger blossoms. (Use two the same size and one smaller.) Pierce the centers, insert the stamens and adhere the stamens using hot glue gun. Using a paintbrush, paint the flowers and leaves with Distress Crackle paint and sprinkle with Rajni Chawla’s Crystal Clear glitter. Adhere the blossoms and leaves to the card base as shown using the hot glue gun. Use the Heat It tool to shrink any glue strings. Inside of Card: Cut a piece of melon mambo cardstock 6 1/8 x 4 1/8” and adhere to inside of card. 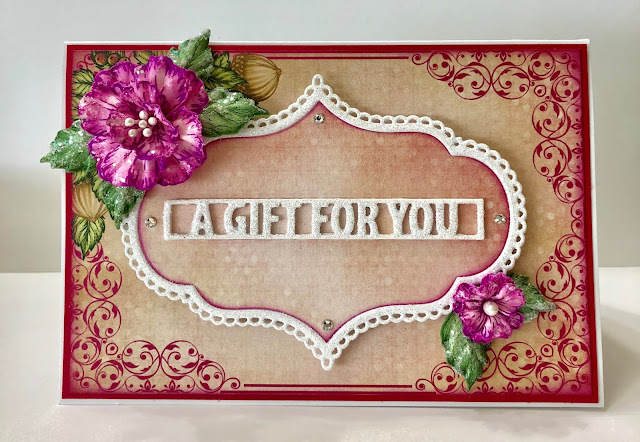 Create a pocket by cutting white cardstock 2 3/4 x 6 1/16”, diecut the top edge using the eyelet edge die from the Classic Borders die, add dries clear adhesive along the bottom and the two side edges and adhere as shown. Diecut paper from the collection using the plain edge Classics Borders die, ink the edges with Magenta Hue ink and adhere to the pocket. Diecut a tag from the paper collection using the Tickets and Tags die, ink the edges and stamp the sentiment. Diecut a mat layer from melon mambo cardstock and adhere the tag. Using a crop-a-dile, punch a hole in the tag and add an eyelet. Add ribbon as shown. Thank you so much for stopping by and please come back again. amazing projects created by the fabulous design team. Oh girl, I love this inside and out. The inside pocket is an inspiration for me! Beautiful flower! Thank you so much Glenda! I so appreciate your comments! Gorgeous flowers Janet! I LOVE the pocket/gift idea inside too! Sensational card! Thank you so much, my friend! You certainly know how to lift me up. 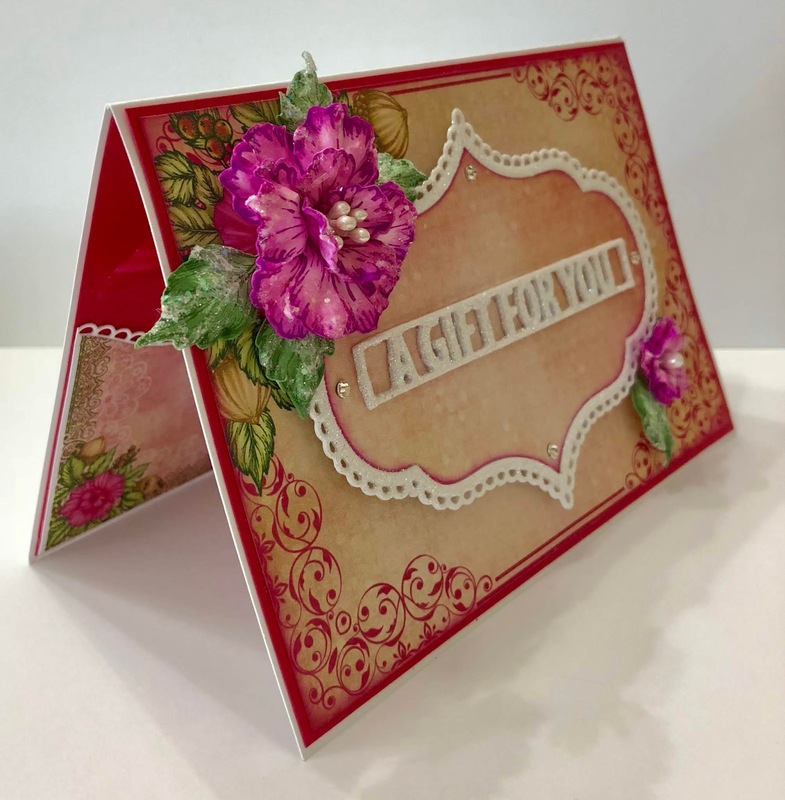 Such a pretty card, I love the inside pocket, it'd be great for a gift card too! Thank you so much Darla! I do love pockets! Such a beautiful card!! Have a nice weekend! Hugs!